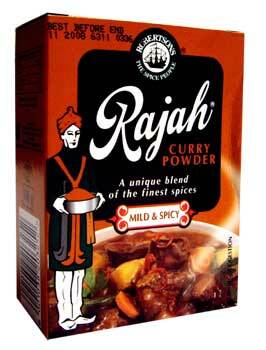 Rajah Curry Powder Mild & Spicy is a unique blend of the finest spices. Spices (Irradiated) (54%), Wheat Flour (Gluten)(Irradiated), Chillies (Irradiated), Mustard, Celery. Contains Wheat, Celery and Mustard. Manufactured in a factory that processes Cow's Milk, Egg & Soya. Lovely to have my favourite Rajah again!!! Years ago in Zimbabwe I always used the Rajah Mild and Spicey curry powder to make an excellent and tasty meal. For those who don't like a raging hot curry this is ideal, as the spicey flavours come throught the milder 'hotness'. So pleased I can still use this here in UK thanks to your site.